Just a little way from the airport! Experience the craftsmanship and the venerable temple! food and housing from ancient times to modern times. Naritasan Shinshoji Temple during the Edo Period. Head temple of Chisan school of Shingon sect of Buddhism. 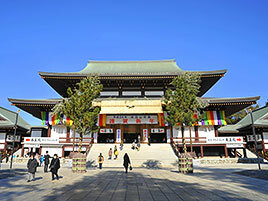 During the first three days of the new year, this temple attracts no less than 3 million people.